13.04.2015. The National Geographic published list of Best Tours in Europe in its Traveler Magazine's 2015 Tours of a Lifetime. Along with Italy, France, Croatia, Switzerland, Scotland, and others, the list also includes Georgia - particularly Alaverdi, Kakheti region. "Monks at the ancient Alaverdi Monastery still ferment wine the way their order has for a millennium, in earthenware vessels buried in the ground. Taste the fruits of their labor on a culinary odyssey led by Max Johnson, the travel outfitter’s founder, whose passion for this unsung corner of the planet is contagious", - the article in The National Geographic reads. National Geographic Traveler is a magazine that launched in 1984 by the National Geographic Society in the United States. 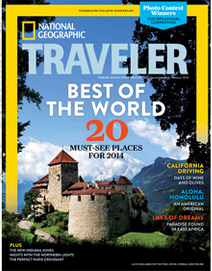 It is one of the most popular travel media in the world and is published in 20 countries in ten languages. Georgia had been in focus within the magazine many times, with photographers capturing incredible images of Georgia’s scenery and authors describing life in the quaint villages and bustling towns and cities. “Blessed Beast” - the picture from Georgia’s mountain region Svaneti - was named by the National Geographic the Photo of the Day on September 23, 2014. The very first images of Georgia at the archives of National Geographic dates back to the 1920′s. Almost 30 images captured by some of National Geographic’s top photographers Vittorio Sella, Maynard Owen Williams and Frederick Simpich when they visited Georgia about a hundred years ago. Pulitzer Prize-winning journalist and National Geographic Fellow Paul Salopek made an unexpected stop in Georgia while he retraces on foot the global migration of our ancestors in a 21,000-mile, seven-year odyssey that begins in Ethiopia and ends in Tierra del Fuego. This was how Georgia became part of his global project “Out of Eden Walk”.